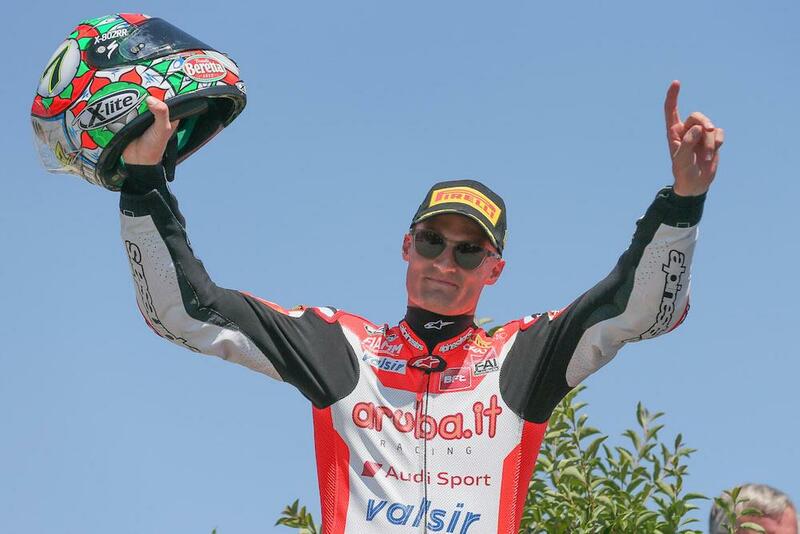 Chaz Davies (Aruba.it Racing - Ducati) overcame a recent fracture to one of his vertebrae to secure a stunning win in race one at Laguna Seca, riding at full pace for all 25-laps of the intense American circuit. He was able to hold off the close attentions of Jonathan Rea (Kawasaki Racing Team) right at the end, to record his fourth win of the year and put memories of his Misano horror crash behind him at the first time of asking. Tom Sykes (Kawasaki Racing Team) was the front-runner for the first half of the race but both Davies and then Rea overtook him in quick succession, into and then out of the Corkscrew, respectively. Sykes would finish third, the only rider except the front two to still be able to make high 1’24 second lap times close to the end, with track temperatures hitting 58°C. Marco Melandri (Aruba.it Racing - Ducati) placed fourth but was not in the hunt for a podium and finished some 17 seconds down on his team-mate. Xavi Fores (Barni Racing Ducati) was fifth, after early top five rider Eugene Laverty (Milwaukee Aprilia) crashed out. Leon Camier (MV Agusta Reparto Corse) secured a strong sixth but still well down on the leaders. Nearly nine seconds behind the MV Jordi Torres (Althea BMW Racing Team) was seventh and 13th placed qualifier Michael van der Mark (Pata Yamaha Official WorldSBK Team) ended his first day of racing in America this season eighth. Leandro Mercado (IodaRacing Team Aprilia) was top Aprilia rider in ninth, ahead of the official bike of Lorenzo Savadori (Milwaukee Aprilia). 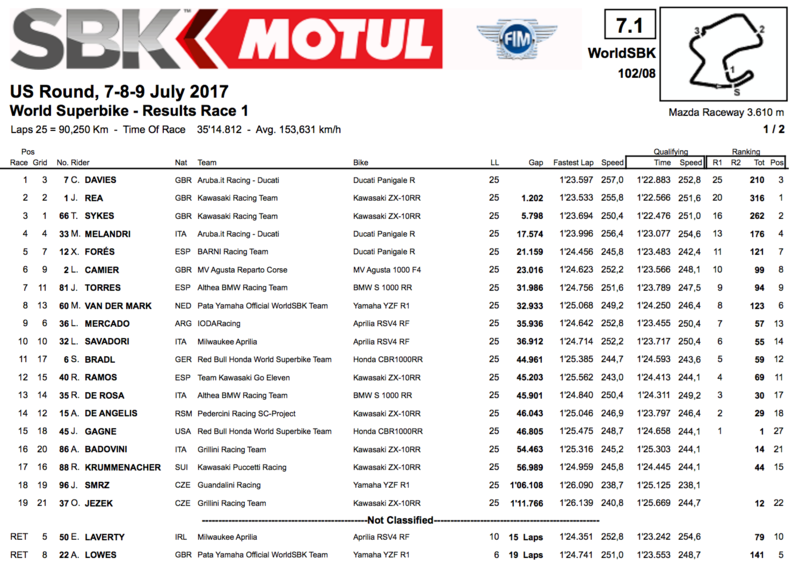 Stefan Bradl (Red Bull Honda World Superbike Team) went 11th and Jake Gagne (Red Bull Honda World Superbike Team) was 15th, for a point in his first WorldSBK race. Alex Lowes (Pata Yamaha Official WorldSBK Team) crashed out. Nineteen of the 21 riders finished.